Andrea Nguyen’s latest cookbook, Asian Dumplings, might be my favorite new cookbook of 2010. The clear, detailed instructions cover a range of filled doughs, giving equal attention to gyoza, steamed buns, potstickers, lumpia, samosas, Filipino empanadas, and more, providing instructions for wrappers and fillings. Soon after buying the book a few weeks ago, I tried out the samosa wrapper recipe, stuffing the pastry cases with leftover lentil-potato curry. 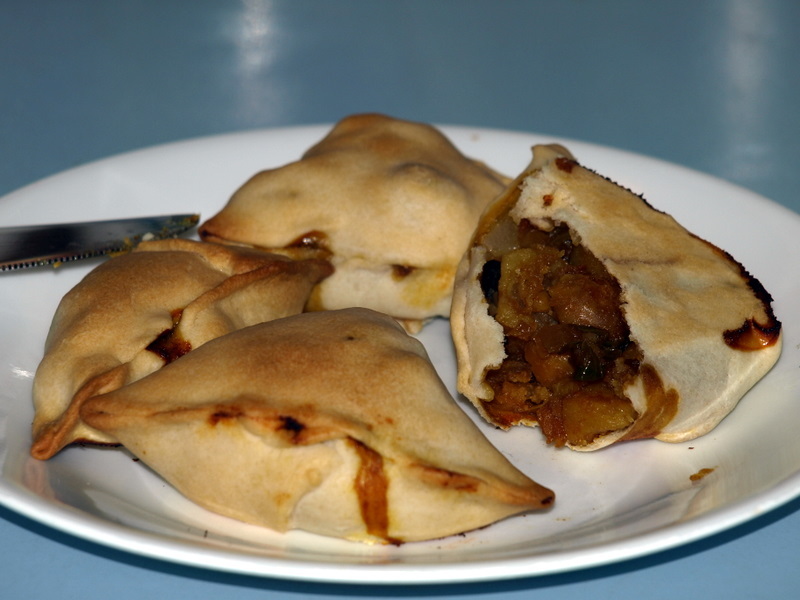 The dough, made by rubbing flour and shortening together with a little water, came together quickly and was easy to shape….but I decided to bake the samosas (rather than fry according to the recipe instructions), so the resulting texture wasn’t as tender or flaky as I might have liked. To make the pastry wrappers, boiling-hot water and flour whiz together in the food processor, then rest for at least 15 minutes to soften. Half the dough is rolled into a rope, which is cut into blobs and rolled into rounds. The rolling technique seems fussy at first–the dough is pressed flat, then just the edges are rolled thinner. Why? So that the “belly” of the wrapper is the same thickness as the doubled-over edges. After half a dozen or so, my brain and hands found a rhythm, and the filling and folding steps were easy. Finished dumplings boil gently for 8 minutes, or can be frozen, uncooked, for later use. I may never buy another bag of frozen dumplings ever again–the wrappers were tender, closer in texture to fresh ravioli than commercial dumplings or premade wrappers. The samosas and jiao-tse barely scratch the surface of Asian Dumplings’ wealth of interesting, varied recipes. If you’re looking for a “technique” book to keep you entertained in the kitchen all winter, look no further. A bonus: most of the recipes yield quantities sufficient for sharing, so you can have a dumpling-stuffing fandango or a lumpia rolling fiesta to celebrate the winter solstice. Cathy Erway of Not Eating Out in NY is a dumpling-making addict, hers are all chinese style but worth taking a look at. Yes–I am guilty of overstuffing the little bundles of joy. I also think I mounded the filling rather than spreading it flat…next time I’ll use a butter knife rather than a spoon to portion the filling. Does your great aunt make the wrappers from scratch? It would probably take me at least 100 or so tries to get good at it. Mounds of filling tend to work fine, just smallish ones. 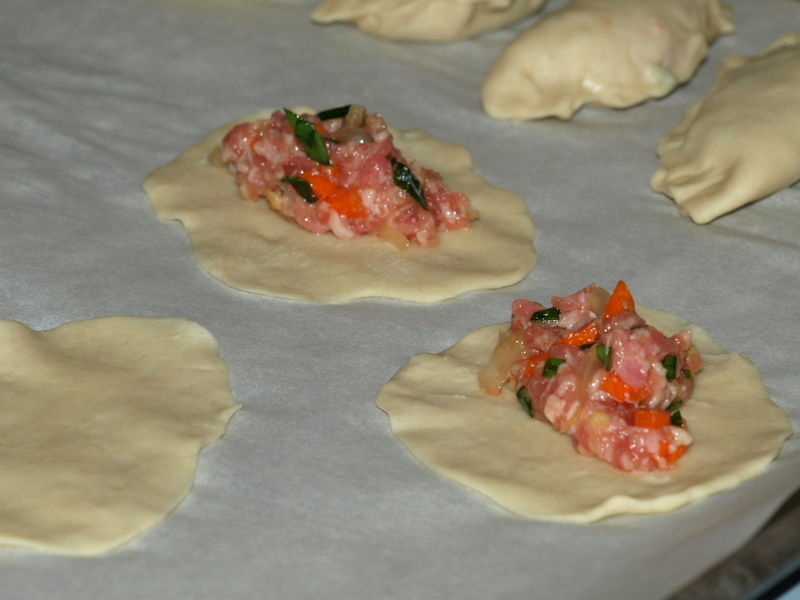 The gyoza recipe I have makes minimum 100 with less than a pound of meat. Aunt Noriko doesn’t make her own wrappers anymore; but I think she used to. At the very least I’m sure she did when they were stationed in se asia and hawaii many years ago. I keep meaning to try making dumpling wrappers myself; the pasta machine might be a good idea to make the super-thin ones. Thanks Celeste, I just added that one to my Christmas wish list. Before we moved to TN, our neighbors were two generations of Filipinos and we loved the dumplings they made. I was so thankful our son was their sons’ friend because it always got us invited to their big family functions, lol. Take a look at “Memories of Philippine Kitchens” by Amy Desa….loaded with interesting Filipino recipes, photos, and stories.